So far as the world knew, the birth of Simon Bolivar at Caracas, Venezuela, on July 24, 1783, was of no greater importance than that of any other child. Perhaps but one person entertained the slightest thought that he would ever be the hero of many battles and the liberator of his countrymen; and that person was his mother. A mother, as a rule, always in her imagination anticipates a brilliant future for her boy. If Bolivar's mother was not an exception to this rule, surely her highest anticipations were fully realized in the wonderful career of her son. His father, Juan Vincente Bolivar y Ponte, and his mother, Maria Concepcion Palacios y Sojo, were descendants of noble families in Venezuela. Nothing unusual occurred in his school-boy days to distinguish him from others of his age and rank. He was attentive to his studies, warm-hearted, generous, and always a favorite among his associates. When he had made sufficient advancement in his studies at home, and had arrived at the proper age, he was sent to Madrid, where he remained several years, during which time he completed his education. Bolivar was now a full-grown man, and as a source of needed recreation after years of hard study, he spent some time in visiting places of special interest in the south of Europe. On his journey he stopped for a time at the French capital, where he witnessed the closing scenes of the French revolution. This was the hour of Napoleon's greatest glory. He was the acknowledged military hero of the age. All France bowed at his feet. Is it not probable that here was where Bolivar caught the inspiration that led him to make an effort to be to his own country, what Napoleon was to France? From Paris Bolivar returned to Madrid, where, in 1801, he married the daughter of Don N. Toro, uncle of the Marquis of Toro, in Caracas. He soon sailed with his young bride for his native country, but it was only a little while until she fell a victim to yellow fever. The sudden and unexpected death of his young wife, to whom he was intensely devoted, so shattered his health and frustrated his plans, that he wended his way back to Europe, where he remained until 1809, when he returned through the United States to his own country. His remembrance of the closing scenes of the French revolution, and the realization as he passed through the United States of the blessings of her free institutions, no doubt account in some measure for the fact that, as soon as he reached Venezuela, he joined the movement then crystallizing into an aggressive warfare for independence, and a larger degree of freedom for his own countrymen. 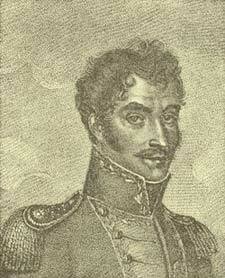 In 1810 he received a colonel's commission from the revolutionary junta, and was associated with Luis Lopez Mendez in a mission to the court of Great Britain, which was rendered fruitless by England announcing her position in relation to the troubles in Venezuela as one of strict neutrality. On July 5, 1811, Venezuela formally declared her independence from the mother-country. This brought on a clash of arms at once. The Spanish troops under Monteverde, owing to a lack of concert of action on the part of the "patriots," forced Bolivar, with his little band of volunteers, to abandon the important post of Puerto Cabello, and flee to Curacao, which was reached in safety, while Monteverde at the head of the Spanish troops gained control of Venezuela. Chafing under defeat, Bolivar, in September, 1812, repaired to Carthagena, where a commission was given him to make war upon the Spanish troops along the Magdalena River. Although his army numbered but 500 men, he succeeded in driving the enemy, not only from the country along the Magdalena River, but entered Venezuela, and forced his way westward to the important towns of Merida and Truxillo, where the people gladly welcomed him and rallied to his support. Encouraged by his success, and embittered by the brutalities of the enemy, as he pressed forward he issued his noted proclamation of "War to the death." He soon routed Monteverde's army at Lastoguanes, forcing him to take refuge in Puerto Cabello, while Bolivar pushed forward, entering Caracas in triumph August 4, 1813. But the tide of battle soon turned. The Royalists concentrated all their available force, and a number of bloody battles ensued, and finally Bolivar's men, inferior in numbers, were badly defeated near Cura. The fall of Caracas soon followed, and before the close of the year 1814 the Royalists were again in full possession of Venezuela. Though defeated, Bolivar was not dismayed. He had great faith in the righteousness of his cause, and his consciousness of this fact seemed to give him that courage which never knows defeat. He next went to Tunja, where the revolutionary congress was in session, and notwithstanding the misfortunes of war and the bitter opposition of a few personal enemies, his enthusiastic reception showed that he still retained the confidence and respect of the people. He was soon given command of an expedition against Santa Fe de Bogota, where Don Cundinamarca had refused official recognition of the new union of the provinces, which, without any conflict of arms, was crowned with success by the surrender of the rebellious leaders. For this service Bolivar received the special thanks of Congress. The Royalists having captured Santa Martha, Bolivar was ordered to retake it, but failed in his attempt. In May, 1814, he resigned his commission, and went to Kingston, Jamaica, where an attempt was made to assassinate him, which resulted, by a mistake, in the murder of another. Later on he went to Aux Cayes, in Hayti, where President Petion assisted him in organizing an expedition which, though it succeeded in reaching the main-land in May, 1816, eventually failed. But Bolivar's past experience had taught him not to go wild over a victory, nor be discouraged by a defeat, so he returned to Aux Cayes, where he secured reinforcements, and in December landed his troops, first at Marguerite, and then at Barcelona. At this point a provisional government was formed and all the available military force was promptly organized, and placed in readiness to resist the invasion of Morillo, who was at the head of a strong, well-disciplined army of Royalists. The opposing forces met on February 16, 1817, and a desperate battle, lasting three days, ensued, resulting in a complete rout of the Royalists, who, while retreating in great disorder, were assailed with such impetuosity by small bands of patriots, as to make their overthrow complete. Being now the undisputed commander-in-chief, Bolivar seemed irresistible. Victory after victory crowned his efforts, until he established his head-quarters at Angostura, on the Orinoco. From this point, after a thorough reorganization of his forces, he pressed forward over the Cordilleras, and effected a junction with the army headed by General Santander, commander of the Republican forces in New Granada. The armies thus united proved to be invincible. The entire march was characterized by a succession of victories, ending in a complete overthrow of the enemy on August 7, 1819, at Bojaca, which gave him full possession, not only of Bogota, but of all New Granada. This brilliant achievement attracted the attention of the civilized world then, and as we read about it now, it forcibly reminds us, in its conception, the skill and rapidity of its execution, and its results, of the wonderful march of Sherman from Atlanta to the sea. Taking advantage of the great prestige his marvellous victories had given him with the people, he procured the passage of a fundamental law, December 17, 1819, uniting Venezuela and New Granada under one government, to be known as the Republic of Colombia, of which Bolivar was made president. Bolivar was now at the head of the grandest army he had ever commanded. The Royalists, under Morillo, having been beaten at several points, induced Bolivar, at Truxillo on November 20, 1820, to consent to an armistice for six months, which he did; no doubt with the hope that meantime a treaty of peace might be effected and the war thus brought to an end. Subsequent events, however, gave strong reasons to believe that the armistice was a mere ruse to gain time while Morillo could be recalled and General Torre placed in command. Bolivar, no doubt incensed by this apparent trick, determined, upon the expiration of the armistice, to strike a blow that would not soon be forgotten; which he did at Carabolo, by attacking and completely routing General Torre's command, compelling the fleeing fragments to seek shelter in Puerto Cabello, where two years after they surrendered to Paez. This practically closed the war in Venezuela. On August 30, 1821, the constitution of Colombia was adopted amid great rejoicing, with Bolivar as president and Santander as vice-president. But there was more work to do, and no one could do it so well as Bolivar. He determined that nowhere should the Royalists have a foothold in the whole country. He attacked them at Pichincha, in Ecuador, and after a desperate struggle they were forced to retreat in disorder, while victorious Bolivar with his enthusiastic followers triumphantly entered Quito, June 22, 1822. Next Lima was taken, but owing to the dissensions among the Republican factions in Peru, Bolivar was compelled to abandon the city, which was again occupied by the Royalists, while he withdrew to Truxillo. Having thoroughly reorganized his forces, and gotten everything in good condition for an aggressive warfare, he again assaulted the Royalists with unrelenting vigor, driving them before him, and finally administering a crushing defeat on the plains of Junin, August 6th; after which he returned to Lima, leaving Sucre, who had already displayed great military skill and bravery, to complete the work. This he did, by gaining a great victory at Ayacucho, which completely dispersed the Royalists, reducing their possessions in Peru to the Castles of Callao, which Rodil, after a little over a year's successful resistance, was compelled to surrender. Upper Peru having detached itself from Buenos Ayres, was organized as a separate state under the name of Bolivia, in honor of the man who had accomplished so much for its freedom, and who by the first Congress of the new republic, which convened in August, 1825, was made perpetual Protector, and requested to prepare for it a constitution. The country having been freed from armed resistance on the part of the Royalists, it next became Bolivar's duty to provide laws for the proper government of the people. Time proved this to be a more difficult task than meeting an open enemy on the field of battle. Many local leaders had been developed during the struggle for independence, among whom no little ill feeling was aroused by their scramble for recognition. Then there were some who were jealous of Bolivar's great popularity and influence with the people. They were busy in trying to turn public opinion against him by telling the people that he would use his power to add to, rather than lighten, their burdens. This feeling was intensified when he presented his plan of government for Bolivia to Congress on May 25, 1826, accompanied by an address in which he doubted the wisdom of extending the right of franchise indiscriminately to the people, and showed clearly his preference for a centralization of power, by proposing a president for life clothed with supreme executive powers, including the right to name his successor. It was charged by his enemies that this would be a monarchy in fact, and a republic only in name. Meantime Paez, military commander in Venezuela, refused to recognize the constituted authorities, and assumed an attitude of open rebellion. But the presence in a short time of Bolivar, his old commander, followed by a personal interview and a decree of general amnesty, resulted in a complete restoration of peace and loyal adherence to the government. Bolivar and Santander having been re-elected to the respective offices of president and vice-president, Bolivar, before the time fixed by law for him to take the oath of office, resigned the presidency of the republic, with a view to retiring into private life, and thus refuting the charges made against him by personal enemies, that he was simply working in his own interest, and for his own personal aggrandizement. But in response to Santander's earnest appeal, and a resolution of Congress urging him to resume his position as president, Bolivar went to Bogota, and there took upon himself the oath of office. He soon issued three decrees: One granting general amnesty, another calling a national convention at Ocana, and a third for the establishment of constitutional order throughout Colombia. All eyes were now turned to the national convention at Ocana, which was to assemble in March, 1828. This was made the more important by the fact that it was to determine whether Bolivar's plan for a strong centralized government, backed up by ample military force, or a government controlled more directly by the great body of the people, should prevail. The events of the past year had served rather to strengthen Bolivar's position, and the action of the convention seems to have crystallized it into law, for a decree soon followed, dated August 27, 1828, giving to Bolivar supreme power over Colombia, which he continued to exercise until his death, which occurred at San Pedro, on December 17, 1830. Thus closes the life of one of the most remarkable characters the world has ever known. He possessed the intrepid courage and dash of a Sherman, the unrelenting firmness of a Grant, and the tenderness of a Lincoln. Local revolts against lawful authority always yielded to his personal presence and counsel. We fail to find in his history a single act of cruelty recorded against him. His proclamation of "War to the death," was a military necessity. The Royalists had shown no mercy to his soldiers. They had refused to treat them as prisoners of war. They had fired upon his flag of truce. They gave no quarter to revolutionists, but put them to death wherever found. And there was but one alternative left, and that was, unpleasant as it must have been to a man of such kindly nature, to meet such brutalities by a threat of retaliation in kind. The proclamation was not prompted by a spirit of cruelty, but rather by a love for humanity. It had the effect which he no doubt intended it should, and that was to secure the same treatment for his soldiers when captured, that the civilized world acknowledged due to prisoners of war. He was in no sense mercenary. He expended nine-tenths of his fortune for his country's freedom, and when voted a million dollars by Congress he promptly declined it. He was always magnanimous, even to his bitterest enemies. He died comparatively poor. His remains sleep at Caracas, the place of his birth. His soul is with God. Monuments have been erected to his memory, one at Caracas and another at Lima. But his life-work has erected a monument in the hearts of his countrymen that will never perish. He sowed the seed for the harvest of a better government and higher civilization for all Spanish America. The influence of his example is not confined to his own country, but is felt throughout the civilized world. To-day, among the brightest and best of the world's good and great men, may justly be placed the name of Simon Bolivar.